I want to talk about something that plays out in the communities I love. There’s this feature of the onset schizophrenia that makes it extraordinarily hard to treat. We call the before-full-blown-schizophrenia stage ‘prodromal‘, and if you can catch it right in that stage, or close to it, your outcomes are much better. Except that the big obvious signs of schizophrenia in that stage are negative symptoms: speaking in monosyllables, emotional flatness, anhedonia, disinterest in activities and relationships and friendships. And in most cases, this part plays out in relative silence. Your friend stops reaching out to spend time with you, flakes out on group plans, seems bored in conversation. After a while, you stop being the one to call. They’ve found other friends, they just aren’t that into you, you’ve got other friends who put more work into the relationship. It’s quiet and it’s insidious, and I’d bet you don’t quite notice it until you run into each other at the store and wow, it’s been months since you hung out! So, what happens in most of the prodromal cases is that the person quietly retreats–maybe not even quite noticing that they are–and then when the positive symptoms of schizophrenia set in (hallucinations or delusions or magical thinking, etc), there isn’t a support system there for them. There aren’t friends there daily who can confirm that they’re going to work or taking medication. There isn’t friendship for friendship’s sake; relational interactions are important. And the extent to which this occurs is fairly predictive of outcome of the disorder. 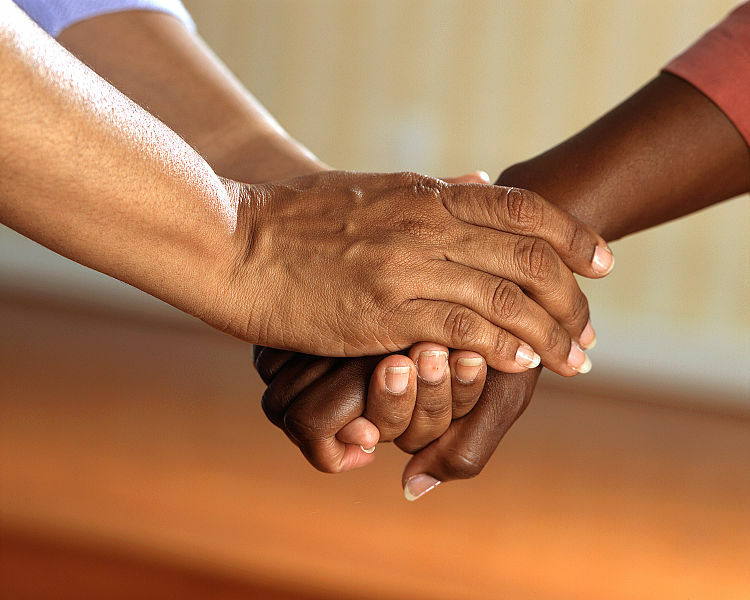 High social support means fewer episodes and hospitalizations, better medication adherence. Lower social support…doesn’t. And back to communities I love. Communities have hierarchies. There’s variance in how much they’re enforced; there are levels of enforcement and policing and explicit/implicit acknowledgement of the rankings. The thing is, communities, even those created to be Not Like The Rest of Society, have values on multiple axes. Charisma, though perhaps a slightly altered definition, plays a role. Ditto for the halo effect, though attractiveness might be assessed slightly differently. And so through accidental privileges and intentional power-grabs, some people in the community end up more liked and more likeable. I am not positive, but I would guess that it is somewhat harder to be in a community where you’re not supposed to be stigmatized, where your particular Problem isn’t unusual, and to have all of that and watch them say “oh no, that sounds bad” and help everyone else more. And that this problem is magnified when the community you’re in is one you joined because The Rest of Society already did a bad job of caring. And of course, people wish to prioritize helping their friends, and I think we mostly accept and encourage this. But it remains that some strangers will say “X happened”, and there will be an outpouring of support and love and empathy and praise. And you can have the same thing…maybe you have it worse, maybe you can’t afford to be so public about it, or don’t have the social support to let you present a showered and articulate and slightly-self-deprecating face. Maybe you don’t have the right language; you hate being crazy, you don’t know how to preface your anorexia-thoughts with how you know that healthy can be at any size, but sometimes your brain lies…because you aren’t at the place where you know it does. And this is a problem. These are the people you want, in the abstract, to help the most–the ones who are new to the community, who aren’t already popular, who aren’t able to be effortlessly cared-about. They’re also the ones that can sound like they pattern-match for the people you’re in this community to avoid. They can be the ones who trigger you or make you slightly uncomfortable. And you joined this community to be safe and relaxed away from The Rest of Society, right? You can try to fix this, in these communities. You can assign people to make up the difference; to do the checking in and supporting. You can try to deliberately close the gap. Except that these communities also tend to put lots of value on being open and honest…and this sort of thing can quickly feel fake and dishonest. Not to mention, it’s work! You’re not being asked to comfortably inhabit your one safe space, you’re being asked to do emotional work to keep it. And The Rest of Society doesn’t do this, and weren’t you trying to carve out your own place that wasn’t emotionally exhausting? But, in the mental health community, you’re in a community that’s explicitly about supporting people without ready access to society at large. So it might be even more important that you work hard to help more than just those who can passionately and lucidly explain their pain. But…it’s easy to fall into patterns of identifying with charismatic leaders and using specific ingroup vocabulary, and helping the people who can tell you exactly and clearly what they need (with the implied understanding that if you’re busy or unable to help, they’ll get support some other way). Because there’s a difference between someone looking up at you and saying I need everything and I’m mostly okay, but could you do this one thing? and diffusion of responsibility is a hell of a drug. I…don’t have a solution to this. I’m not sure I even have part of one. But I do know that in my community, in the wide, tumblr and blog and activisty mental health community, there are those who get help, and those who get helped more. Two notes: One, I’m not talking about privilege here in the classic social justice sense, because I see this replicate across homogenous groups who align on the commonly cited axes of privileges. For instance, I’d expect the phenomenon in a small group of equal-income, same-aged, same race friends. Two, by note One, I’m not saying we should ignore the role privilege plays, just that I had a word limit. *This…happens in real life more than I care to admit. **For the record, The African Violet of Friendship is sometimes a much better idea than the slow fade. I ran a series last week about the finnicky steps of getting a therapist. This is the masterpost, with links to every part of the series. It will end up as a new tab on the top of every G&H page as well. 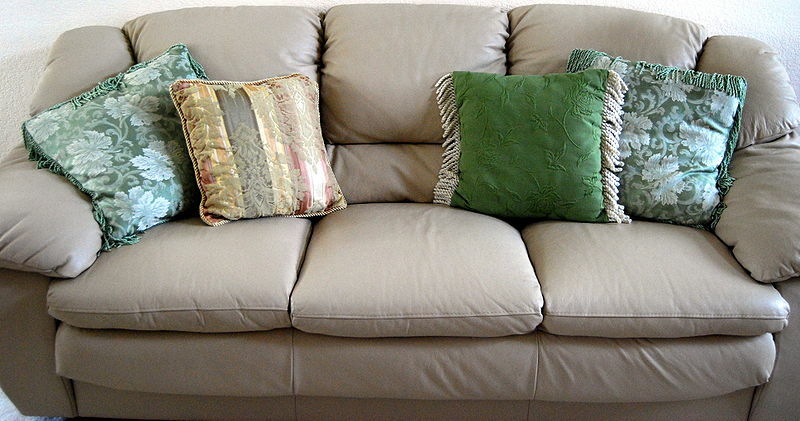 Go forth and sit on couches! Note: For decreasing the amount of language confusion in this post, I’m using ‘therapist’ as a blanket term to mean ‘someone who practices therapy’. In fact, this is not precisely accurate, though it seems to be colloquial use. For sorting between psychiatrist, psychologist, and therapist, take a look at the Terms section in Part I. Part IV: In which forgotten things are unforgotten. I am not a therapist! However, lots of people ask me a lot of the time about getting therapy, and are often willing to keep me updated on what worked and what didn’t. This four-part guide, which is essentially the sum total of every bit of advice I could think of, and a few I didn’t come up with (thank you, proofreaders and feedback-givers!) aims to make the therapist-getting part less mysterious and more accessible. If you have had previous experiences where you found it hard to tell someone in person what had been going on, you might consider bringing in writing or notes. I have done this! It was very helpful, and meant I didn’t accidentally get too tangled up in my emotions and forget something important. Write poetry or journal in the moment and feel okay sharing it? Also a thing. Even my clinical training scenarios have included stories of clients bringing in such things, and if it means giving your therapist a clear picture of the issue it seems worth it. With one therapist, I showed up to our first meeting with data: a calendar reflecting how often I’d had trouble with my ED and significant events around each episode. I’ve found it very helpful to avoid scheduling therapy between daily tasks. Sometimes there are surprise!emotions and I’ve felt much better when I had an hour or so to process the experience before interacting with people. Despite liking my therapist(s) and seeing improvements as a result of therapy, I’ve often been tempted to skip sessions when I was having especially bad brain days. (If this sounds like a terrible plan, you’re correct!) My solution to getting around this was twofold. First, I set up a reminder in my phone to go off an hour before I had therapy. It read something like “Past-Kate wants you to remember that therapy makes you feel better and is worth doing” Secondly, I asked my partner to, if he ever thought of it, remind me of times when I felt really great after therapy, or point out progress I’d made. So far: success! Sometimes insurance only covers a certain number of sessions (or your budget will only get you X amount of meetings.) I strongly encourage telling a therapist about this up front or as soon as you know—it can give them important information about structure and prioritizing how you meet, as well as allowing them to prepare you for termination of treatment. I am actively looking for things I’ve left out, so if upon reading any section, you have unanswered questions–even if you think they are trivial or might mean you’ve missed something, please let me know. I would much rather spend time responding with “no, that’s in paragraph two” than have a whole subset of people think they didn’t read properly and not tell me I was unclear. Further, many thanks to Rita Messer for checking over the advice within. Part III: In which couches are sat upon, forms are filled out, and intake is had. The first session is an extension of the “Do you want to tango?” testing-each-other thing. The therapist wants to know if they can help your particular case, and you want to know if you feel comfortable/matched with them. It’s a first ‘date’ and if they’re metaphorically rude to the waiter, or you just don’t click, it’s okay not to start a relationship. -acknowledgement of the confidentiality policy: therapists will keep nearly everything confidential, but they are bound by law and ethics in some very specific circumstances. If you want an idea ahead of time, here’s the gist. -if you have medical or other psychiatric information that they might want or need, there’s a potential for signing releases to allow them to have this information. I’ve signed releases so that my medical info was accessible to my therapist and releases to allow therapists to have my previous therapists’ files on me. I was glad I did both these things, but you aren’t required to do so. -In larger establishments like a health services center or such, it’s common for there to be initial diagnostic questionnaires, like a depression measure. This session will likely involve very little Classic Therapy ™. Your therapist will be trying to get a feel for your issues and circumstances and might asks things like “Can you tell me what brought you here?” and ask about your previous mental health history. I’ve also been asked if I was suicidal or had a history of suicidality and whether or not I had a history of being sexually assaulted or raped. The latter might be as a result of where I was seeking therapy—a women’s center, but I’m not certain. Therapies can also look quite different from practitioner to practitioner–one might be very structured and use lots of forms and worksheets (not necessarily a downside–I like these! ), while another might be more informal or conversational. You can ask things like “What does [X therapy] look like in practice?” to get a better sense of this. Intake–the first session or the pre-first session–is exhausting. It’s telling all of what makes you need therapy and answering a fair number of invasive questions. I strongly recommend that people plan something relaxing and low stress (if you’re introverted, something that does not involve human interaction) for afterwards. Even thought I usually know what intake should feel like and have done it multiple times, I have to spend ~3 hours decompressing afterwards. Most of the rest of therapy is not like this, but in order to have the relevant information, the therapist needs to have lots of starting knowledge about you. This is well worth it, but if at all possible, do not put your first therapy session between other scheduled and important actions. Does the medium therapist communicates with you in align well with how you prefer communication? I had phone-phobia for a while–therapists who didn’t use email weren’t worth it, because I’d never be able to get around the ugh field to call them and reschedule. Does the therapist let you direct the session or do they initiate most angles or discussion? There’s not a One True Way. I prefer therapist-initiated angles of conversation (though I will sometimes point out that I’d like to focus on something time-sensitive), some people prefer the opposite. Noticing what you prefer here can improve future therapy. Part II: In which emails are sent, scripts are given, and therapists are contacted. Your insurance type and any other payment concerns. Did you get a recommendation from someone? Therapists sometimes aren’t taking clients or might not have experience in your relevant issue. For instance, if you write that you have trouble with OCD, and the therapist knows they haven’t got relevant skills, they might not want to take you on as a client. I am experiencing trouble with [issue, with as much or as little detail as you’re comfy starting with/previous diagnosis]. Do you take [insurance type]? OR Do you negotiate sliding scale payment rates? I have [work/school] on [days] but could do [general sense of free time, such as “weekends” or “Monday-Thursday afternoons”] If you’re not accepting clients, do you have suggestions for other therapists who might serve my needs? I’m [Legal Name], and I heard about you from [Campus Service]. I’ve had previous problems with an eating disorder (anorexia, currently well-managed EDNOS), and I’m looking to do some additional work on my coping mechanisms. I’ve had lots of success with CBT, and you list this as a modality you use. I was seeing [therapist at location], but with the new school year, am in need of a new therapist. I have school on Monday-Thursday from 8-3, but am free after that and Fridays and weekends if you take weekend appointments. My insurance is [Name of Insurance], and you list this as one of the ones you take. Do you have availability? If you’re not accepting clients, do you have suggestions for someone else who might serve my needs? Note: For decreasing the amount of language confusion in this post, I’m using ‘therapist’ as a blanket term to mean ‘someone who practices therapy’. In fact, this is not precisely accurate, though it seems to be colloquial use. For sorting between psychiatrist, psychologist, and therapist, take a look at the Terms section. Part One: In which potential therapists are found, modalities are defined, adjectives are adverb-ed, nouns are verbed, and info is dumped. So you’re thinking about maybe seeing a therapist? Therapists can list a bunch of stuff that they technically ‘have training’ in, without having spent time practicing said stuff. So, just because a therapist lists Cognitive Behavioral Therapy (CBT) doesn’t mean they regularly use it. Asking questions like “How much/what percent of your practice involves [my specific issue]?” can give you a better picture. Conversely, because therapists also can list a bunch of stuff because it will attract clients, you get opposite problem: don’t necessarily distrust a therapist because they say they’re trained in Rorschach–it’s not unusual for grad programs to teach it, because some people really do want a Rorschach administered. CBT is not the only evidence-based therapy, and I actually don’t always recommend it to people if they already introspect and self-CBT regularly. [Here’s a bit about why]. Another way to get a therapist is via referrals. You can ask your medical doctor, friends who have seen therapists, or friends or acquaintances who are therapists. I’ve had more success with the last, but the more recs the merrier! You can look them up on a site like the Psychology Today therapist finder to get specific information like what insurance they take. If some seem like they could be a good fit, you can set up an initial meeting or two. (It may be a good strategy to see several people before picking one who seems the best fit). The next section of this series will handle setting up an appointment. Licensed therapist: Varies by state, but someone who holds a license to practice therapy, but not a PhD. Includes Licensed Social Workers, Licensed Therapists, and Marriage and Family Therapists. Further info here. Psychologist: Has a PhD or PsyD, has done a one year internship, generally more expensive. I don’t find their practice of therapist to be significantly better–it often seems worse. I’d suggest a psychologist over a therapist for children (because of the amount of developmental psychology training needed) but not otherwise. Psychiatrist: Has a medical degree. Psychiatrists are quite expensive. As a result of this in combination with their nearly unique ability to prescribe psychiatric medication, (Psychologists may in a handful of states) they’re often seen specifically for this. For young people, particularly young people who interact a lot with social media or tech, I sometimes advise finding someone close in age to you–even someone currently working towards a license in psychology–they’ll be used to experiencing life in some way close to yours. Secondly, people in this stage of working usually seem to treat therapy as a collaborative measure. Thirdly, I’ve found that it feels a little easier to question your therapist about the direction of therapy or raise concerns if they are closer in age to you. This by no means means that non-age-matched therapists won’t be helpful, but it’s served as a useful heuristic for some. But what kind of therapy? There are more types than the ones I list below, but these crop up a lot. Wikipedia has been the best single resource I’ve found for short explanations of those not listed below. CBT: pretty much what you expect. Working on cognitive and behavioral aspects of issues in question. DBT: Dialectical Behavioral Therapy. Mindfulness based therapy. CBT meets awareness and acceptance training, as well as distress-tolerance. Here’s a great summary. REBT: Rational-Emotive Behavioral therapy. Created by Albert Ellis. Philosophy meets CBT. The Wikipedia article is excellent. You can see demonstrations at the Albert Ellis Institute in NYC. CBT often involves cases of questions or lines of questioning or roleplaying that can feel silly. I usually frame this as something that can feel weird, but is intended to get your emotional and intellectual reactions into place. You might know intellectually that no, all your friends don’t hate you, but still have panic attacks. The point of the exercise is less about knowing in an intellectual sense and more about installing habits of thinking that will prevent the panic or anxiety your emotional brain is doing. Some people can get into this paradigm easily, some find it hard to suspend their annoyance at obvious questions. Next post tomorrow: contacting potential therapists! *If your therapist isn’t familiar with non-monogamy and you want backup, this guide is aimed at clinicians. Buying cheap or free apps for my smartphone. 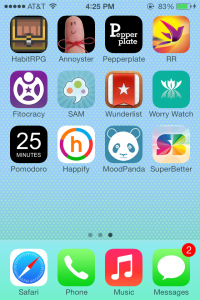 It took some work, and plenty of the apps were used for a few days or a week and then discarded as unhelpful or useless, but at a grand total of 99c spent across six or seven apps to find two gems (Self-Help Anxiety Management and Recovery Record) that massively improved my quality of life? Well worth it. 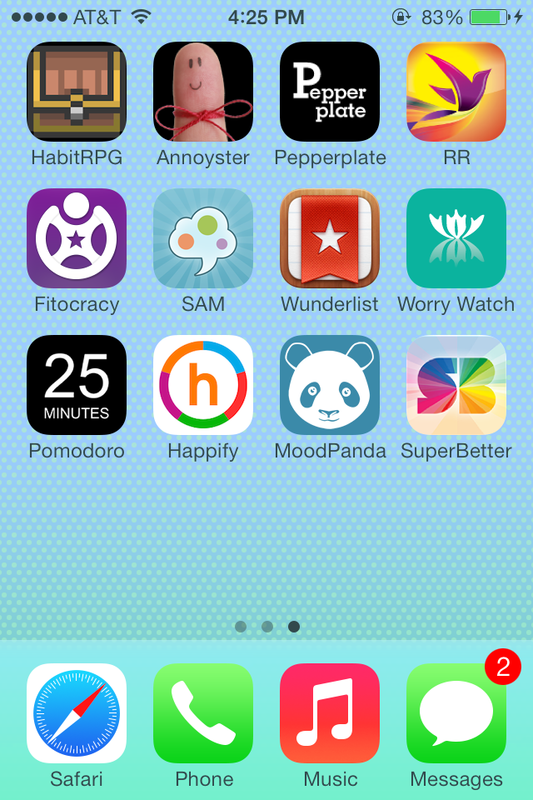 Sometimes the apps were mental illness specific, for anxiety or meal-tracking. But I also use Annoyster to send me random alarm reminders, (“Therapy is helpful and worth going to,” reads my most recent one. “Eating mindfully is a new habit I’m developing.” and “Have you had a glass of water recently?” have been previous alarms.) Fitocracy* to gamify exercising without obsessing over calories burned, and PepperPlate to make menus for the week. Having something to play with or occupy your hands in conversation can help with dermatillomania, trichtillomania, nail biting, and a host of other nervous/anxious habits. Fidget/spinner rings are especially nice for professional situations–where you can’t pull out buckyballs or rubberbands, etc. A friend and I bought gorgeous, matching ones, and I’ve toyed with mine during interviews, therapy, and particularly boring lectures. Almost immediately after purchasing, I ended up with long enough fingernails to paint–I wasn’t biting or tearing at my nail beds constantly. Even if you’re not the anxious type, I recommend them as a way to get respite in a conversation or interaction. More socially acceptable than looking at your phone, they give me something to focus on when I need a few seconds of space or distance. Here are some on Etsy, and cheaper variants on Amazon. Though I haven’t used it personally, some friends use what I know as massage putty, but I’m sure the expensive stuff could be replaced with some cheap, dollar store putty. Build hand strength, make weird shapes, copy newsprint. Rubik’s cubes are favorites of my friends, though I’ve never picked up the appeal. Books can add up in cost more than a phone app, but honestly, if a single book is cheaper in time and money than therapy….it’s well worth it. Though I’ve had access to free therapy for years now, books have been where I developed coping strategies, learned to recognize failure-mode patterns of thinking, and have me the words to explain what was going wrong in my head. And these haven’t been highly technical books–I’d just wander into the psychology section of a bookstore and find the ones that seemed to be less about spirituality and bad tropes and more about science, particularly ones that talked about coping strategies, evidence-based therapy, or didn’t rail against medication on the back cover. Finding people with other mental illnesses. I actually don’t seek out people with eating disorders–it can put a real strain on me if we’re not at similar levels of recovery. But spending time around people who are used to having bad brain days that make socializing hard has taken a lot of the pressure of social interactions. I wasn’t trying to hide my coping mechanisms, and I got praise and reward for little victories (I ate a snack! I decided not to go to the gym today and felt good about it!) that wouldn’t mean much to a neurotypical observer. *For over a year, I’ve encouraged friends and, well, strangers on the internet to use Fitocracy for their non-shamey system. Recently, the emails from the site have been all about weight loss and fat burning. I’ve solved this by disabling all emails, but the trend from site-for-people-who-want-to-feel-good-about-exercise to site-for-people-with-also-some-guilt is annoying. I live in a large house with eleven people and occasionally questionable wifi. So, on the morning of Sunday’s FtBCon, I walked to campus to find a quiet room to do my panel. Option 1: temporarily under reorganization, which seemed to involve moving desks around and dropping them for maximum noise. Option 2: Mysteriously full. It was Sunday morning, fellow students! This is when you nurse that post-Saturday hangover, not take over campus in the wee hours of the morning. Option 3: All of the electrical outlets, save one (under a water fountain, of all places) were non-functional. Occasional hordes of singing? shouting? who knows? students. But! It was 11:02 at this point, and so we began! I was a bit frazzled to start, and occasionally impaired by students doing whatever the hell they were trying to do, but I enjoyed the conversation. The little display-quotes at the top of Psychology Today’s page always make me a touch antsy. The thing about writing popular psychology is that you want to to actually be popular, and “well, we tested this on college students, and in at least this one iteration of the research, it seems like mayyyybe there’s a relationship between This One Cool Trick and increased performance on IQ tests” has far too many caveats to make for a headline. So we assure you that doing ten jumping jacks before bed will make you pass your math test, and the things we’re a little more certain about get less fanfare. But I’m stuck on a bus, and I started thinking about that claim. A little bit of exercise? I mean, I usually feel better for going for a walk, but I’ve never thought that’s a direct result of exercise. More like inevitable results of the interplay of being away from a to-do list, trading fluorescent light for natural light, and stomping around in the snow. Sure, there’s some very basic cardio happening, but I live in the Midwest, the flattest of flatlands. …which also got me thinking about how I’ll avoid exercising when I’m having especially bad brain days. There’s significant amounts of societal pressure to exercise–to not just be slim but toned and fit and lean–and heading to the gym uniquely taps into a whole host of too-positive feelings about potentially losing weight and fitting into beauty norms. When you add jerkbrain, then BAM sudden impulses towards obsessive exercising! So I stay away on bad days, and on the good I try to aim my happiness about exercise in the direction of appreciation for strength and endurance building, rather than skinniness. It seems unlikely–possible, but unlikely–that exercising briefly is dramatically changing brain chemistry. It seems to improve functioning in moderate depression. It usually improves circulation, which does nice things all over your body. But it also plays into norms about how being a good person means having a gym membership and being healthy (in the colloquial, appearance-based sense). By all means, were this to be correct (and see the part about it being a hunch) this would not be a reason to stop exercising! In fact, it might be a better reason to exercise than ever. Taking advantage of brain quirks, or placebo effects generally, to improve your life is still improving your life. *I mean it. This is a hunch. Somewhat more than a wild guess, but only because I think “studies this stuff for fun and a diploma” counts for more than Wild Guesser status. **Also, I’m disinclined to think that it was entirely made up. There’s likely at least one study suggesting this conclusion. ***Not so mysterious, but if I’m going to be hunch-ing, I’d rather not shoot myself in the foot by also demonstrating a poor grasp of neuroscience.